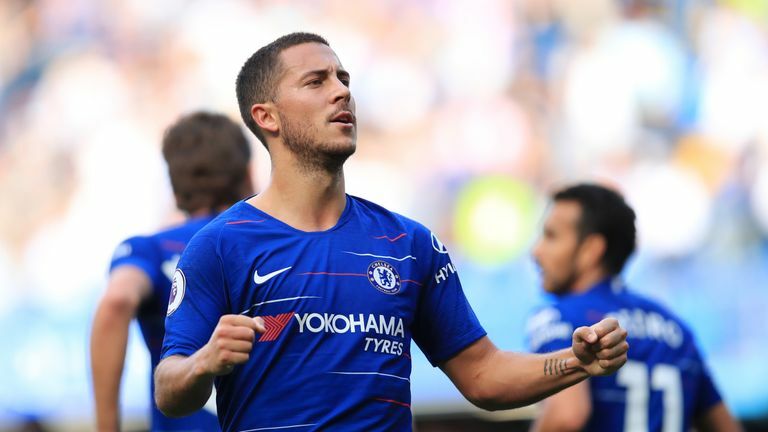 Sky Sports' Jamie Carragher says Eden Hazard is the best player in the Premier League and the Belgian claims this season is his best yet - but do the stats back them up? 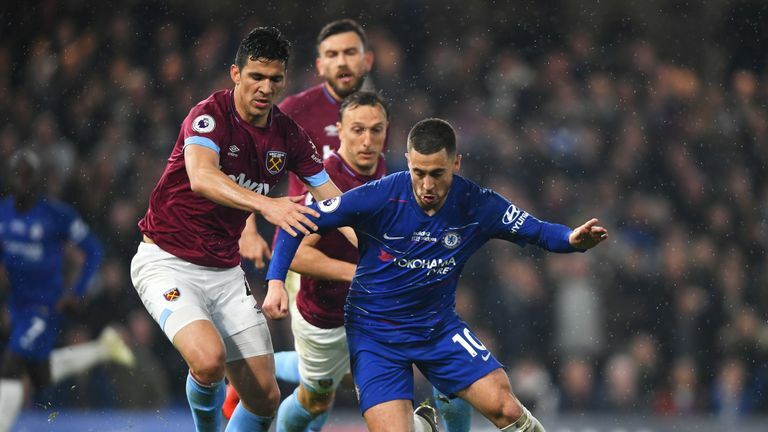 Hazard scored both goals at Stamford Bridge on Monday including a goal-of-the-season contender - cooly finishing after a slalom run through West Ham's midfield and defence. Carragher hailed the Belgian as the league's best on Monday Night Football: "I'm talking over a four or five-year period, who I think is the best player in the Premier League. He does things that other people can't do. How many people could have scored that goal?" Speaking after the win, Hazard said: "I watched it [the first goal] after the game and, yeah, that's why I'm on the pitch. "Statistics show it's my best season. The way he [Sarri] wants us to play is the way I want Chelsea to play, so that's why I have a good relationship." The 28-year-old tops the latest Power Rankings form chart - measured over the last five games - and has soared clear of Salah and Sterling in the season-long chart, suggesting the Real Madrid target has been the league's top-performing player this campaign. Hazard tops the Premier League this season for goal involvements (28), assists (12), chances created in open play (69), dribbles completed (110) and fouls won (95) - in addition to netting 16 goals, his joint-best league total in England. So the statistics do, indeed, suggest this season has been Hazard's best yet in a Chelsea shirt - but can the Blues fend off interest from the La Liga powerhouses this summer? If reading on skysports.com, comment below to get involved in the debate at the bottom of this article, but please adhere to our House Rules. If you wish to report any comment, simply click on the down arrow next to the offending comment and click 'Report'. Hazard was joined by team-mates Ruben Loftus-Cheek (No 3) and Kepa (No 9) in the top 10 this week, while Leicester also had three representatives among the elite: James Maddison (No 2), Jamie Vardy (No 4) and Youri Tielemans (No 5). Other players to make the top 10 include Crystal Palace stopper Vicente Guaita and Burnley's Ashley Westwood, while Liverpool's Roberto Firmino (No 7) and Everton's Lucas Digne (No 8) both slipped but retained top-10 standings.